Faces of Giving is thrilled to be partnering with The Vaid Group on a multi-year, multi-faceted project around engaging and networking high-net-worth (HNW) donors of color. 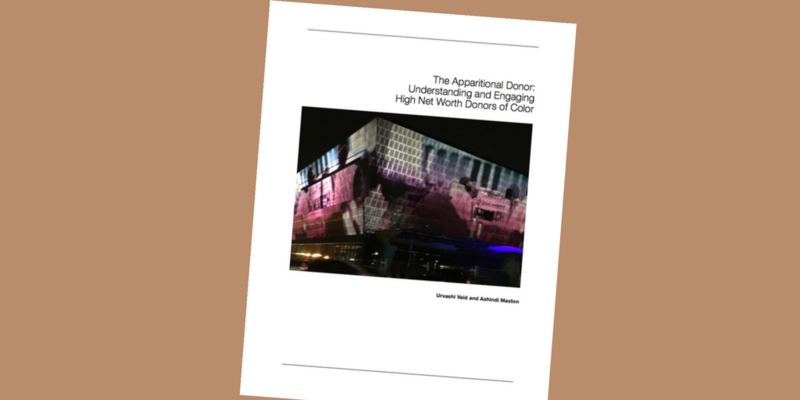 It has been our initial finding that the priorities, interests and experiences of HNW donors of color are largely invisible in discussions of mainstream HNW philanthropy. We have found that HNW POC are generous and philanthropically engaged but that they remain invisible to mainstream philanthropy and isolated from each other, rendering their giving less impactful. The absence of HNW donors of color as an organized force in philanthropy has material consequences. It renders critical experiences, resources and talent missing at a moment in which our society requires new ideas, investment and innovation. The project hopes to build knowledge about, engage and network high-net-worth people of color (HNW POC) engaged in philanthropy. It consists of several closely connected projects that will be conducted over the next two years by a team of researchers and organizers experienced in philanthropy – the POC Donor Collaborative. Develop and test a case statement for donors of color to come together into a new donor network focused on racial, economic and social justice. Next steps will be the exciting, timely and necessary work of networking, connecting and organizing high-net-worth people of color so that the potential power of these alliances can be unleashed to transform philanthropy and society towards inclusiveness and progressive social change.